Strawberries are one of the most delicious summer fruits that you can make a variety of refreshing recipes, especially for hot days. In a bowl place the egg yolks with sugar and vanilla sugar and cook over steam with continuous stirring, until the mixture thickens. Add the broken white chocolate and stir until is melted. In chilled mixture of yolks and chocolate add the whipped cream of sweet cream and slowly stir. Pour the gelatin with two tablespoons of cold water, mix and immediately add them to the filling and mix with a large spoon for stirring. Put the strawberries in a blender, place the sugar and cook briefly until 1/3 of the mixture does not boil. Pour the gelatin with two tablespoons of water and mix until raise, then add it to the hot mixture with strawberries. From sweat cream make a solid whipped cream and add to the cooled filling strawberries. Stir. 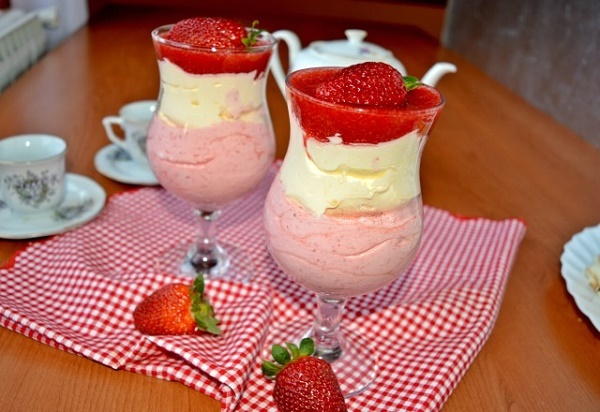 In a glass cup for decoration apply the filling of strawberries and lay it over the yellow filling. Mix and cook the remaining strawberries for decoration with sugar. Add the gelatin and allow to cool. The cooled mixture pour through the yellow filling and leave to cool. Want a slim figure? Excellent combination of yogurt and cinnamon.